There is a limited selection of Colditz hotels, since Colditz is a small town of 5,000 people. Pension Zur Alten Stadmauer, in town. Hotel Waldhaus, on the edge of town. Youth Hostel, in the castle. Sonnenhof Bed and Breakfast, near Colditz. My favorite Colditz hotel is a small, friendly one in the oldest part of town called Zur Alten Stadtmauer (At the Old Town Wall), at Am Graben 5. The manager is Ralf Gorny, a very pleasant man who speaks excellent English and is very knowledgeable about the history of the castle. The hotel is a two-story building only a few blocks from the castle and two blocks from the main square. The hotel is comfortable and homey with an old-fashioned charm. Ralf has a library stocked with books on Colditz and is ready to answer questions and offer suggestions about things to do and see. They serve a yummy (and substantial) breakfast buffet which is included and the rooms are reasonably priced. I really enjoyed staying there and highly recommend it! I have marked the location of the hotel on the Colditz town map on the travel to Colditz page, as well as the map below. Address: Am Graben 5, Colditz. Another of the Colditz hotels is the Waldhaus, a small, older hotel on edge of town at Lausicker Strasse 60. The hotel is not within walking distance of the castle, so you would need to have a car or get a taxi. Taxis are available locally. For more information, check the website: www.waldhaus-colditz.de. Telephone: 49 034381-43371. In April 2007, a Colditz Youth Hostel was built in one wing of the castle (where the German garrison was located). The facilities are very modern and you don't have to be a "youth" to stay there. The Youth Hostel has 34 rooms, and rates include breakfast. Open 7 a.m. to 10 p.m. year round. Rooms can be booked online at Youth Hostel or reached via e-mail at Colditz@jugendherberge.de or tel: 49 34381-45010. In the small town of Zchirla, just 2 km from Colditz, Sylke Friedrich runs a pretty bed and breakfast called Sonnenhof. She speaks fluent English and French, and used to be a guide to the castle, so can help visitors with their questions. She works from home and is available to drive guests to and from Colditz for € 7. For room rates and photos, or to book a room, see www.sonnenhof-muldental.de. At Meuselwitzer Weg 3. A very pretty, elegant, and reasonably-priced hotel just outside of Colditz, in an attractive rural setting. The hotel is about two miles (or 3.5 km) outside of Colditz and can be reached by bus or taxi from the town. 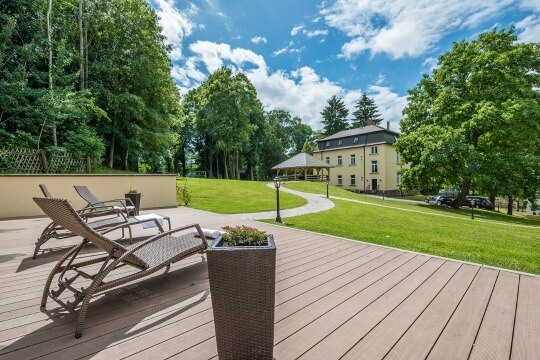 You can visit their website parkhotel-muldental.de to see photos of the rooms and prices. They also have bicycles for guests to use.